Five sperm whales Physeter macrocephalus stranded on a beach of the island of Texel in the North of Holland. All whales died after a struggle in the shallow waters. Four more sperm whales, probably belonging to the same herd, stranded on more easterly island Wangerooge in North Germany. 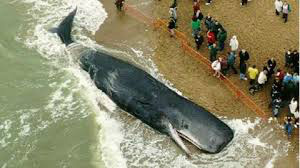 The cause of stranding whales remains a mystery. One whale could loose its orientation because of a mistake or ear injury, and then the heard will follow to maintain group cohesion, who knows. But as soon as they reach the breakers with a strong wind from sea they seem to be lost. The group stranded on the Texel beach consisted of young bulls, probably coming from the Norwegian Vesterålen islands. They migrate during the winter to the Azores to mate with members of the huge female population that stay there the whole year with their calves. Normally the bulls follow a route north of the Scottish islands. But must have taken a wrong turn on their northern route leading them to the undeeper water of the North Sea.